Lock in a great price for Silachi Hotel – rated 8.6 by recent guests! 1. Hotel location. Easily accessible to tourist attractions. Acceptable breakfast, warm pool and sauna, comfortable bed and pillows, all needed items and accessories in room like toothbrush, heir drier, coffee, tea, free water. Underground parking, all fasilities is good. So generally recommend, but be careful with such small items, and always check and deside details in advance with management, in order to avoid any climes and problems. Close to center and most popular sites, malls, supermarkets. Newly renovated hotel, spacious standard room, nice bathroom with no smell, quiet. The staff at reception and concierge were helpful. There is a nice GUM old big market for dried fruits shopping. One of the best souvenirs from Armenia! Silachi Hotel This rating is a reflection of how the property compares to the industry standard when it comes to price, facilities and services available. It's based on a self-evaluation by the property. Use this rating to help choose your stay! Yerevan Train Station is 1.2 mi from the hotel, and Yerevan Airport is 4.3 mi away. When would you like to stay at Silachi Hotel? This twin room features a satellite TV, air conditioning and mini-bar. House Rules Silachi Hotel takes special requests – add in the next step! Silachi Hotel accepts these cards and reserves the right to temporarily hold an amount prior to arrival. First day, they told me that standart rooms not available, and offered lux type. Then i have make reservation of standart room fm booking, with one double bed, they give me room with 2 separated beds, when i contact reception for this question they told me that they will put this two beds together and it will be double bed))). Meantime after few time and debates, they issued a normal double bed room. Thanks for this, and i was quite satisfied by check in and comfortable room with tea/coffee, free water and very comfortable bed, and bathrobe. But on second day, when i like to prolong stay for one more day, i asked what they prefer, to book again by booking.com or pay directly? They reply that in case i pay directly they give me 3 euro discount)), and yes i pay directly, but on the evening i was surprised that they close.to.me acceess for pool. And explain it that pool is free only for gests fm booking))) and as far as.second day i have prolonged not true booking.com i have to pay for pool 3000 ARM Dram (about 6 euros) per person)))) so o get 3 euros discount but have to pay extra 18 euros for pool, ok after half hour debates, they called manager and we get access to pool free, but they close it within half hour. So until last evening i had quite good opinion and feedback about this hotel, due to staff really wanted to assist, but this situation with pool, changed my mind. Also there was some issues in room about which i have to wright now, upon situation with pool, in bathroom shower head is not working- damaged, and on garbage bin is not working opening pedal, so it is not safe to open by hand garbage bin in tuilet in public place. Also tv should be bigger size in such type rooms. It was too small compare to room size and it was difficult to view fm bed. The key didn’t fit well into the door lock and one needed to fiddle each time quite a bit. Rooms have thin walls so you can hear noise well. The hotel is at least 15 to 20 mins walk from the main shopping street where also a lot of the good restaurants are. There are busses outside but I recommend to take a taxi or Yandex car if you don’t want to walk. They are very reasonable. My room overlooked a busy square and it was not soundproof enough, so I could hear cars rushing by. But the level of noise was tolerable. As I told the receptionist at check-out, in July I was staying in a major 4-star hotel in Copenhagen, and it was not as good as Silachi. It is modern, has spacious air-conditioned rooms and a large swimming pool for everyone to enjoy. 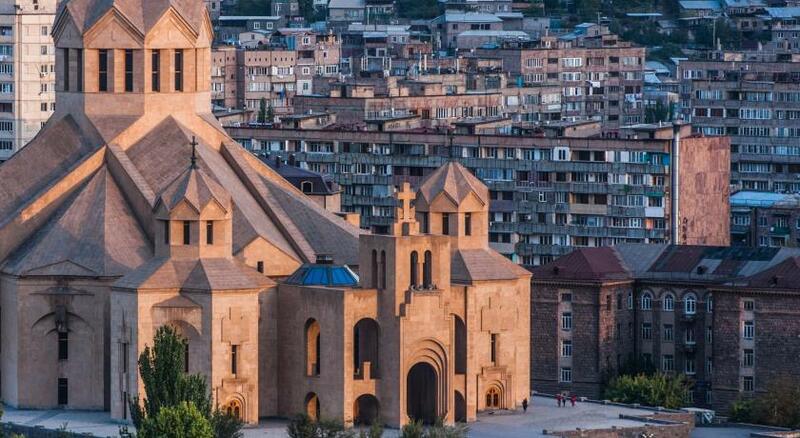 It is located near a metro station, a shopping mall, Yerevan's main cathedral and a 10-minute walk from the Republic Square, the city's centerpiece. The staff were very obliging and quick to respond to any request. Lack of vegan recipe in the breakfast menu. Swimming pool was free and clean.